In existence for thousands of years, Traditional Chinese Medicine is the world’s oldest and most comprehensive system of medical care. Acupuncture has a clearly documented history of around 2,000 years, however it is believed to have first been used over 4.000 years ago in ancient China. The Chinese believe that the practice of acupuncture originated during the Stone Age, when a crude version of the acupuncture needle as we know it today was made from stone, known as the bian stone or needle stone. Bian means ‘the use of a sharp edged tool to treat disease’, and was put to use in a number different ways. Originally this tool was used to incise abscesses, drain pus (nice!) and let blood out for therapeutic purposes. With time and experimentation the bian stones became more and more refined and it was discovered that the insertion of very fine needles into certain points around the body was able to treat a whole host of ailments. 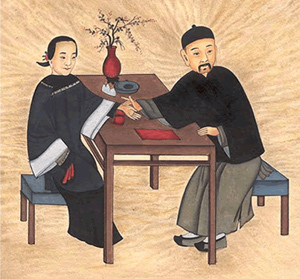 During the Warring States (475-221 BC) two major philosophical ideologies dominated Chinese thought and culture, these were Confucianism and Taoism. Confucianism rejected surgery as it opposed the slicing and dicing of the body, one of the main beliefs being that the body is sacred and should remain ‘complete’ and undamaged. The Confucians believed that it was vital that the body be presented whole to ‘the ancestors’ in death, which is why one of the most frightening methods of execution to the Chinese people was decapitation. As the Emperors philosophical beliefs at the time prevented the development of anatomy and surgery, acupuncture was developed further and thrived. Acupuncture provided a way to cure internal disease with external means. The other school of thought during this time was the philosophy of Taoism, Tao meaning ‘the way’. It is based on the idea of maintaining harmony between man and the universe. Yin and Yang are very much rooted in the Taoist concept of health, that is to achieve perfect balance and harmony between the opposing forces in the natural world and become part of their rhythm. The concept of balance between two mutually opposing yet mutually dependent forces, that is, Yin and Yang is central to Traditional Chinese Medicine. ← Acupuncture for pain relief, don’t suffer in silence – have a treatment!